Selling lvl 121 Dark Knight with Red Draco, Explorer Chair, maxed fever buffs and 155 crystals still in bag. Equipped with unique items mostly, only 2 or 3 gears still epic. Selling lvl 121 Night Lord with Red Draco, Explorer Chair, maxed fever buffs and 1035 crystals still in bag. Equipped with unique items mostly, only 2 or 3 gears still epic. It take lvl 120 to max the passives. Another 9 lvls to max the throw. From my experience, it's very good in single-target but hard to play in mobbing unless you have a decent weapon. It relies on 3rd job skill to farm in SF. Shouldn't be a problem with legendary claw minimum. Legendary claw can 2-hit SF80 5 target mobs with it's 3rd job skill and 1-hit mob with the 4th job 30sec skill. 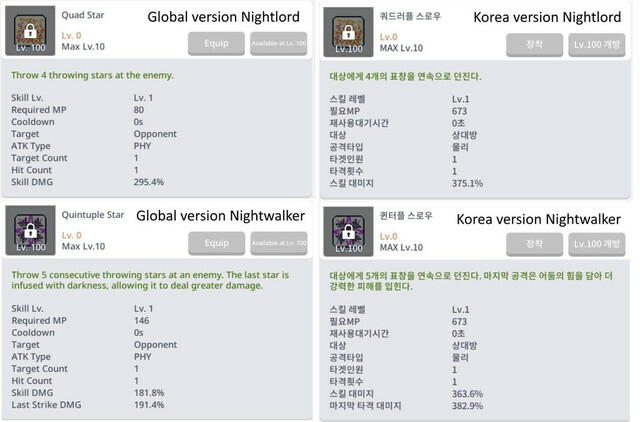 Anyone knows after NW Lv100, which passive to prioritise maxing? Property Agent. Any questions feel free to pm me. So u essentially do half damage. We are casual players enjoying this game but are active almost daily, and hope that we can build up our community. Anyone willing to donate your maple account from Asia 2/Scania ?? Or buy from me la. What donate rubbish. Anyone playing WA? What skills should I max out first when I get to 4th job? Heng I never transfer everything from my NL to my NW, but I know people who have. Last edited by JohnnySasaki; 13-09-2018 at 02:06 PM..
We are casual players enjoying this game but are active daily, and hope that we can build up our community.